Someone could call Hrvatski Športski Klub (in English referred to as Zrinjski Mostar FC) the oldest, but also the newest Bosnia and Herzegovina club. Founded more than a century ago, they were put in the fridge for almost 50 years (the whole former Yugoslavia era), only to reappear in 1992. One thing is for sure, since 2000, only Željezničar compare to Zrinjski, in terms of titles won. 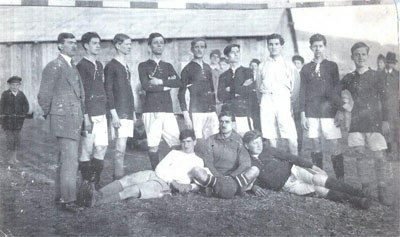 HŠK Zrinjski Mostar before World War I.
Hrvatski Športski Klub (Croatian Sports Club) Zrinjski Mostar were founded in 1905, and consisted of students, encouraged by one of their professors to get involved in sports, not just football. In what were very turbulent times in the Balkans, politically, ethnically, socially, Zrinjski, named after the Croatian-Hungarian Zrinski noble family, considered national heroes in both countries, faced all sorts of hardships, including not being allowed to compete in some tournaments, or, worse, getting banned altogether, all because they were showcasing in every possible way their Croatian identity. The biggest blow came in 1945, right after the end of World War II. Zrinjski, during the war, had taken part in the championship organized in the so-called Independent State of Croatia, a puppet state set up by fascist Germany and Italy. Once the war was over, the new regime banned all clubs that had participated in that competition, a ban that in Zrinjski's case lasted until 1992, when former Yugoslavia fell apart. Since no official football could be played in Bosnia and Herzegovina during the war in the first half of the nineties, all the team could do was take part in friendly games, even visiting Germany and Canada, where large Croatian communities reside. Zrinjski's stadium, with its very characteristic huge stand on the western side. In 1994, the Mostar team could finally play official football, in the newly-established championship of the so-called Herzeg-Bosnia Football Federation. The league lasted six years. 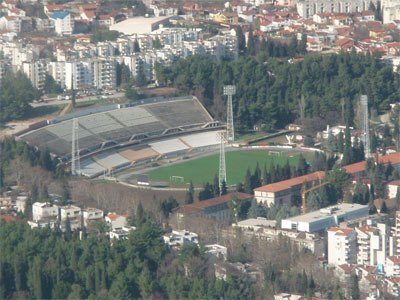 With UEFA having officially recognized only the Football Association of Bosnia and Herzegovina (based in Sarajevo), the Herzegovina (the unofficial capital city of which is Mostar) teams joined the Premier League of BiH in 2000. Five years later, Zrinjski celebrated their first championship title, exactly a century after getting – first – founded. Numbers say that the most prominent player in Zrinjski's history is Krešimir Kordić, having played in more official matches than anyone else, and having scored for the team more goals than any other player. Kordić spent a total of eight years at Mostar's club, but on four separate periods, never staying there more than two seasons. Pero Stojkić, a left back, can be considered their most emblematic player though, not only having started his career at Zrinjski, in 2005, but also serving them for a series of seasons starting in 2011, getting at some point the captain's armband. Given that Stojkić is only 30, he will easily overpass Kordić as the most-capped player in the club's history as long as he stays there just another season. No matter what, the most famous player who has worn Zrinjski's jersey is without a hint of doubt Croatian wonder midfielder Luka Modrić. He signed his first contract aged 18, at Dinamo Zagreb, but spent his first season out on loan at Zrinjski. Despite his young age, he played in 22 league games in the 2003-04 season, scoring eight goals, and showing that he had a bright future ahead of him. Zrinjski have always been very proud of their Croatian identity, and their name/logo is very characteristic of that. Not only the word “HRVATSKI” (Croatian) is included, but also the red and white checkerboard is there, plus, of course, the colours are that of Croatia's flag, blue, red, and white.